Review: If you could take a closer look at war, would you? Well now you can with Bloodlines: Heart of War written by M. Zachary Sherman. Bloodlines takes you back to WWII and other wars, including the Iraq War and a part of the Afghan War. Relive those war times with the Donovan family. The action never stops as you feel the same terror the Donovan family feels as you go through war all over again. Travel through a rough journey of hiding from Germans, Koreans, and other enemies. Place yourself into the life of one of the Donovan's as you go through an adventure of what it is like to be a soldier, rising in the ranks with each family member. Try a different perspective with a member of the family. Start with PFC Michael Donovan and rise from a low rank all the way through to LTDR Lester Donovan. Fly over the enemy lines with Michael Donovan. Escape a submarine with your life with First Lieutenant Aaron Donovan. Explore unknown territory in Korea with Captain Everett Donovan. Repair a damaged vehicle from a crashed plane in Korea with Private First Class Tony Donovan. Receive air support while pinned in Vietnam with Lieutenant Verner Donovan. Help out as a medic on Hamburger Hill with Captain Anne Donovan. After crashing in a helicopter over an Afghan desert, try to find your missing squad with Lieutenant Commander Lester Donovan. Capture a terrorist in Iraq as Lester Donovan's adventure continues. Prepare yourself for a tale of destruction and heartbreak as the Donovan family does its part in this war. 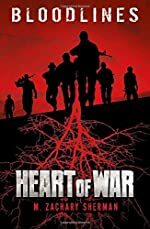 I enjoyed Bloodlines: Heart of War. The author's use of multiple perspectives is what I liked most. The suspense in every chapter pushed me to keep reading another. Before reading this book, war never interested me. However, this book has changed my mind regarding WWII. I was able to visualize how terrifying war can be; and now, I have a newfound respect for soldiers in the military. The only thing I didn't like about this book was that it didn't tell how the people grew up or how they were trained. This book is good for young readers who play the videogame Call of Duty, or for anyone who enjoys war stories. The intense action of war will keep you reading!